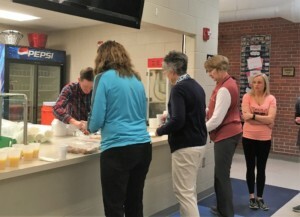 The morning of April 18 was the Freeman TeamMates breakfast. About 70 Mentors and Mentees met together with food and drink provided by the Freeman Board of Directors. Coordinator Kristina Jensen introduced several new mentors and handed out certificates to those mentors who will have met 24 or more times with their mentees this year. Currently, Freeman has 54 matches meeting together. It was an opportunity for matches to visit with each other and to check out some of the new materials and games available for meeting times. It is always exciting to watch the positive interactions of our adults and students! We are always looking for adults willing to mentor and spend about thirty minutes a week with a student at school. If you would like to find out more, check out TeamMates.org. Or, we will be hosting a mentor training in the Freeman Media Center on April 30th at 7:00 p.m. Come and learn more about the program. If you like what you hear, you can then start the enrollment process. For more information, contact Kristina Jensen (kristina.jensen@freemanschools.net) or Teri Nieveen (tnieveen@freemanschools.net).